These are heady times for the Bioscope, with hundreds of visitors all in pursuit of information on Paul Merton, following the mention of his new book and Silent Clowns tour on Have I Got News for You. So, what can we do to catch the eyes of these passing visitors and maybe entice them to find out more about the worlds of early and silent cinema? Well, what about some nineteenth-century studies of animal motion? So, we have two new additions to the Bioscope Library, the first of which is The Horse in Motion, by J.D.B. Stillman, published in 1882. Who he? Well therein lies a tale, because the true author of this work should have been the rather better-known Eadweard Muybridge. 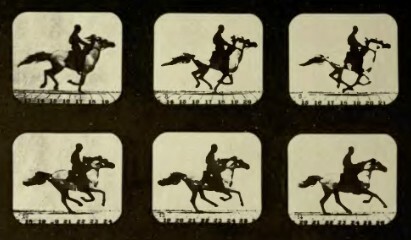 The book, commissioned by Muybridge’s patron, the railroad baron Leland Stanford, was based on Muybridge’s now famous photographic studies of a horse galloping. But master and reluctant servant had fallen out, and the book was published under Stillman’s name, giving Muybridge negligible credit. The book contains detailed description of the studies into the motion of the horse (and other quadrupeds), with five of Muybridge’s photographs and ninety-one lithographs based on his photographs, plus line drawings. 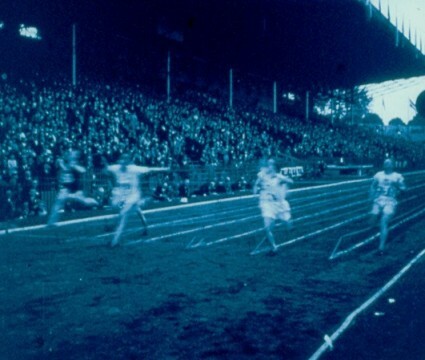 The book’s publication caused considerable embarrassment to Muybridge at the time, as his contribution to the scientific studies was now questioned by several authorities, but it is an important publication nonetheless in the history which took us from sequence photography (or chronophotography) to the successful creation of cinema. It’s available from the Internet Archive in DjVU (6MB), PDF (67MB) and TXT (279KB) formats. It’s a happier tale to tell with our other, complementary, addition to the Library, Etienne-Jules Marey‘s Animal Mechanism, or La machine animale, first published in 1873. 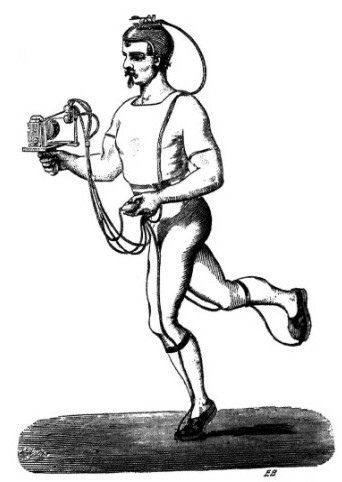 This was the published expression of Marey’s ‘methode graphique’, where, by a variety of graphical devices devised for the measurement of animal motion, Marey was able to demonstrate diagrammatically the walking motion of humans and horses, and the the flight of birds and insects. By this publication, Marey opened up a world of study not previously imagined, and inspired Muybridge and Stanford to undertake their own investigations. Marey did not use photography for Animal Mechanism, but, inspired in turn by Muybridge’s work, would go on to experiment extensively with sequence photographs, developing the science of chronophotography, and through it the mechanism for cinematography. The Internet Archive has both the 1879 American edition, in DjVu (9.9MB), PDF (20MB), b/w PDF (12MB) and TXT (582KB) formats, and the English third edition (not so well scanned), in DjVu only (33MB).